Today marks the launch of two new peripherals from Logitech under their Logitech G gaming brand. Designed to complement the best-selling G502 Proteus Spectrum, a mainstay of LogitechG’s lineup, the G513 mechanical keyboard and G560 speaker system bring new dimensions to what’s possible with their hardware. Just prior to launch we were treated to a hands-on session with the new hardware, and can share some of our thoughts ahead of forthcoming reviews. Recently Logitech refreshed their mainstream mouse lineup, including the flagship G903, and introduced wireless charging technology PowerPlay; a pretty busy winter by anyone's standards. By designing critical components themselves, development teams are more able to fit each within whichever body they're intended for, improving ergonomics and weight distribution. Whether it be new sensors, wireless technology or keyboard switches, their in-house team bring a level of excellence rarely seen amongst their rivals. So what do they have in store this time? 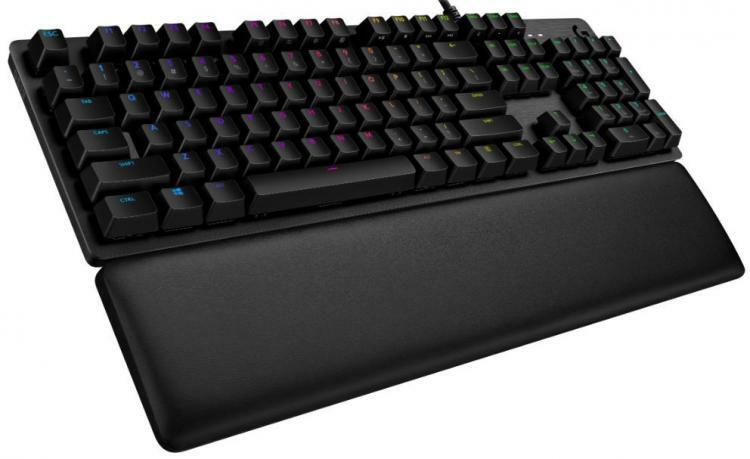 The Logitech G G513 is just the latest in a line of keyboards with some impressive pedigree. The G513 builds on the core gaming aspects of the G413, and adds just that little bit of luxury you expect in a premium gaming peripheral. The headlines for the G513 will no doubt be its role as the debut keyboard to offer Logitech's new Romer-G Linear key switches. Until now the Romer-G was available only as switch with subtle tactile response, whereas the new Linear option has just a smooth continuous keypress. Logitech design the new switch with a 45g actuation force, similar to the widely-used linear Cherry MX Reds, but claim both higher durability and a consistent response further into its projected lifespan. Of course, gaming performance also plays a role in the Romer-G's design. A short 1.5mm actuation point for both the Romer-G Linear and Tactile means that response times will be up-to 25% faster due compared with rival switches. These key switches also incorporate RGB LEDs, allowing you to choose from a pallet of 16.8 million colours for the perfect layout. Or through LIGHTSYNC you may set it up to dynamically adjust to audio or video. The choice is yours. From a construction standpoint, the G513 features the same aluminium-topped chassis as the G413. This and its general sturdiness means that the keyboard is a very stable platform for typing and active gaming. Logitech also offer a plush wrist-rest with durable leatherette top and robust memory foam, chosen to hold its own shape over time rather than the shape of your wrists. Interestingly they have opted to have the wristrest remain separate from the keyboard body, preserving clean lines and eschewing an over-engineered docking solution. Even magnetic mating systems were rejected due to their potential impact on wireless signals. There are other unique aspects to the keyboard that are best left for the review, and indeed one or two which won’t mean anything today, but may be very important in the not too distant future. We will say that during the brief hands we were left with a distinctly positive impression. What good is a gaming system without awesome sound. 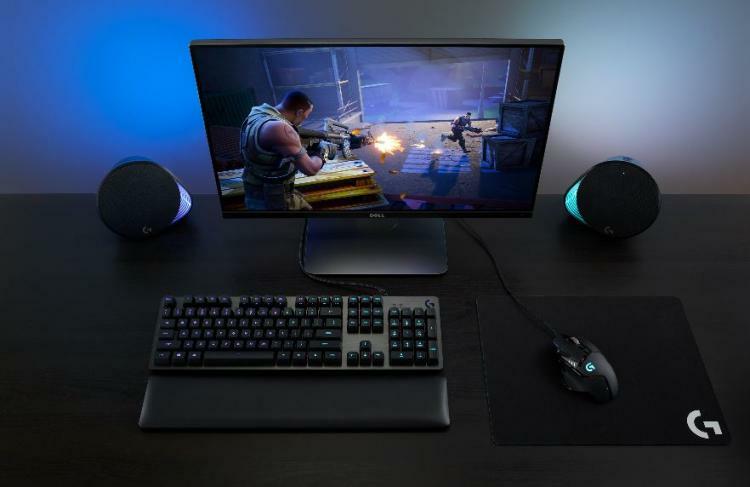 The Logitech G G560 2.1 speaker system is designed to provide excellent audio in a package which is either unassuming or assertively in your face, but only if you want it to be. 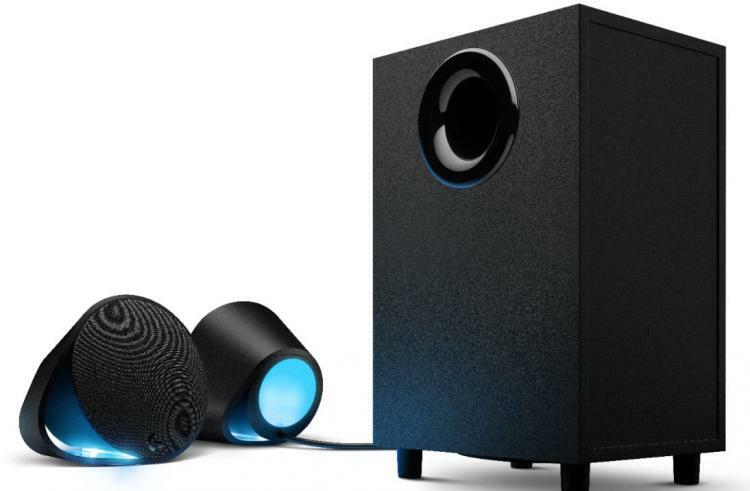 The design builds on Logitech’s 25 years in PC audio, but could be seen as their first out-and-out gaming speaker system for the desktop. The G560 system as a whole provides 240W peak/120W RMS and has a surprising amount of audio clout to it. In demo's the soundstage was all-enveloping but very clear to our ear, with good separation between channels. Despite the compact size of the satellites, mid and high tones didn’t sound in the least bit weedy or distorted, and there’s probably enough oomph to fill a very decent sized room rather than just a small bedroom or office. The subwoofer in particular had a lot of power, to the extent that we’d be a little worried going anywhere near full blast in a flat or apartment for fear of shaking the rooms below. Naturally, the G560’s also support 3D audio through DTS:X Ultra 1.0, but that’s not the limited of their abilities. For starters up to four independent audio inputs are supported via USB, 3.5mm phono and Bluetooth. Thanks to Logitech’s Easy-Switch tech you can switch between sources seamlessly, and for example play music via your phone and game sounds or Discord prompts from your PC. Easy-Switch is definitely a feature that warrants further investigation, both of its capabilities and practical limitations. Of course, what would a gaming device be with the now almost obligatory RGB lighting. The G560 features four LED zones, two for each satellite speaker, which emit from the rear as indirect environmental lighting. These lighting regions are mappable to discrete RGB values and as LIGHTSYNC zones that react to in-game or audio cues. Both the G513 Keyboard and G560 speaker system are powered by LIGHTSYNC technology. A new aspect to Logitech’s already robust lighting configuration tool, LIGHTSYNC synchronises lighting to both audio cues and on-screen action. The LIGHTSYNC app taps into the DirectX rendering pipeline and can capture averaged pixel colour data from selectable regions on the screen, tying them to LED lighting regions on the Logitech mouse, keyboard or speakers. By doing this the lighting can dynamically adapt to what’s happening on-screen for, it’s hoped, a more immersive experience. Another part of LIGHTSYNC that is currently still to be fully exploited is an in-game API for developers which would allow them to trigger LYGHTSYNC lighting changes directly based on in-game events. The example shown was a snippet of GTA V gameplay, where the satellite speakers of the G560 would alternate red and blue to reflect your ‘Wanted’ level. It’s a simple demonstration, but the implications of the feature are quite deep, especially when you consider game modding and the potential an open API would have. The G513 is now available for pre-order in Carbon or Silver* colours, equipped with either Romer-G Linear or Tactile switches, and priced at £159 inc. V.A.T. As such it competes with some of the best keyboards on the market. The G560 meanwhile has an MSRP of £209, also placing it amongst some stiff competition. Both the Logitech G G513 and G560 are available at retailers and directly from Logitech to preorder today. Not for the first time we’ll also remind readers that Logitech’s MSRP listings are a guideline only, and many models can often be found with comparatively aggressive pricing. If you’re interested, definitely shop around for an up to date retail price.